As a compulsive list-maker, I have a list for pretty much everything – a list of books I’ve been meaning to read, a list of things I need to fix around the house, a list of things I want to do with my summer, and a list of terrible puns I can use for blog post titles. My favourite list, though, is all of the unforgettable foods I want to re-create in my own kitchen, mostly because I can’t afford the plane ticket (or in some cases, the time machine) to go back to the place I first tried them every time I have a craving. These biscuits have been at the top of the list for a very, very long time. I first had them at a little café in Mahone Bay, an adorable little town in Nova Scotia that’s a perfect stopover when you’re driving from Halifax to Peggy’s Cove. The food at this little café was lovely, but the real star of the show was the basket of freshly-baked cheddar black pepper biscuits they’d bring out instead of the usual bread basket. The biscuits were soft and pillowy, and generously flavoured with loads of cheddar and black pepper. It was worth the drive just to get a basket of those biscuits. The same summer that I first discovered the little café in Mahone Bay and their delicious biscuits, I also discovered the Cows ice cream shop that sits on a pier in the Halifax harbour. I may or may not have sacrificed a chunk of my paycheque and my waistline to their chocolate cheesecake ice cream. I’m pleased to report that Cows’ cheese is as delicious as their ice cream, if not more. 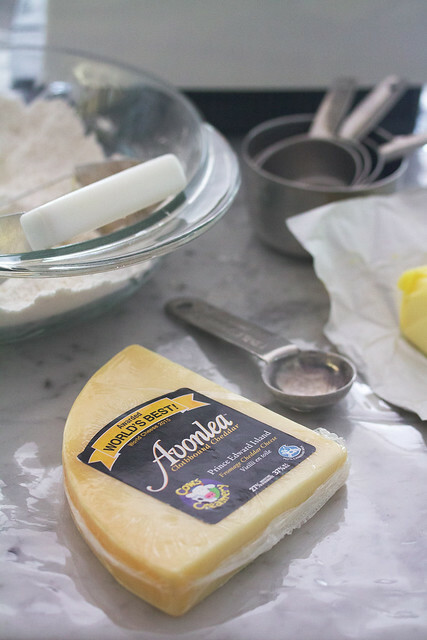 Avonlea is a traditional English-style cheddar that’s made with unpasteurized cows’ milk from local farms. Each wheel is wrapped in cloth and aged for at least a year in the creamery’s caves. It’s sharp and crumbly, like a proper cheddar should be, with a well-rounded creamy flavour. I’m also pleased to report these biscuits are every bit as tasty as the ones I remember from the café. They’re just as pillowy, tender and golden-brown, and loaded with savoury cheddar and black pepper. Obviously, these biscuits are perfectly delicious on their own, freshly baked and still warm from the oven. But if you really want to up your game, they’re even better as the base for a savoury breakfast sandwich stuffed with bacon, egg, and (obviously) sliced Avonlea cheddar. And best of all, you don’t even have to hop in a car and drive all the way to Mahone Bay to satisfy your craving. 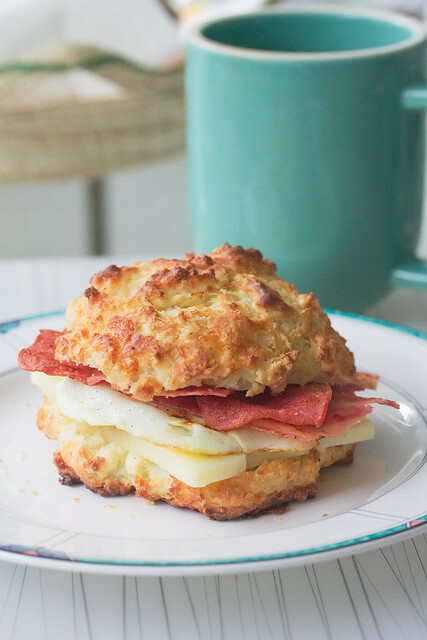 These savoury breakfast sandwiches will have you swearing off the coffee shop version forever. Prefer to keep it simple? 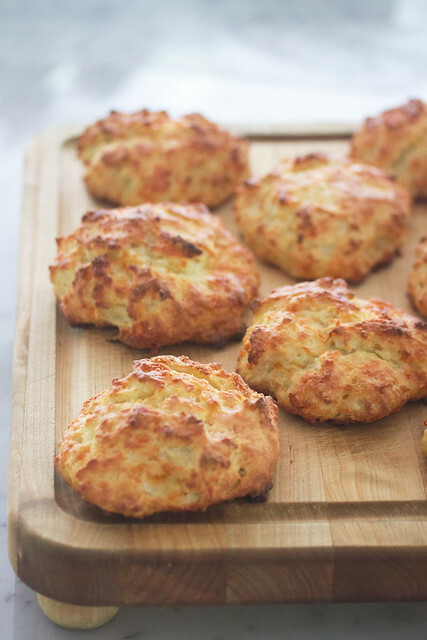 Skip the fillings and enjoy the perfectly golden and fluffy cheddar and black pepper biscuits on their own! Preheat oven 425F. Line a large baking sheet with parchment paper. In a large mixing bowl, combine flour, sugar, baking powder, pepper, and salt. Using a pastry cutter or two sharp knives, cut in the butter until the mixture is coarse and crumbly. Add the cheese, mixing until well combined. In a second small bowl, whisk together the milk and yogurt. Add to the dry ingredients, and stir until just barely combined, stopping as soon as the last few floury streaks are incorporated. Spoon 8 large dollops of batter onto the prepared baking sheet. Brush the tops with melted butter. Bake in preheated oven for 15-18 minutes, or until tops are golden brown. Cool on baking sheet for 5 minutes, then transfer to a wire rack to cool for another 10 minutes. 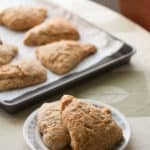 Once the biscuits are cool enough to handle but still a little warm, carefully slice each one in half using a serrated knife. 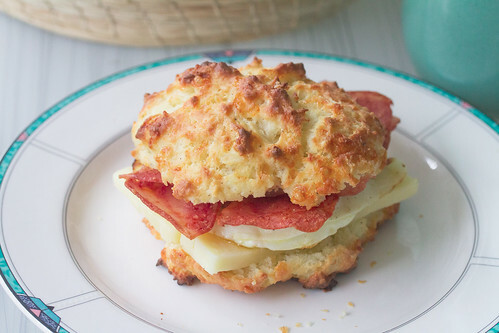 Starting with the bottom half of each biscuit, layer on two half-slices of bacon, an egg, and a few slices of cheddar. Top with the top half of the biscuit and serve immediately. I’m going to make some of these for Thomas to take to work in the mornings. I am constantly making lists too lol this looks so yummy! 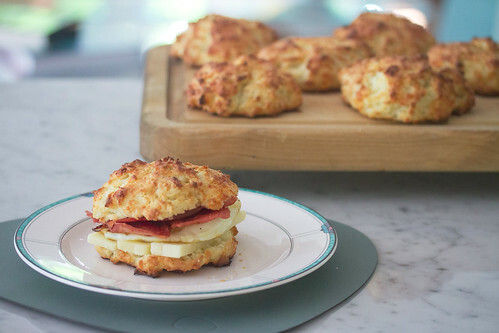 These would make amazing breakfast sandwiches! I pinned this so I can go back and make these soon. That is one gorgeous breakfast sandwich! I have a feeling the addition of cracked pepper really elevates this recipe. 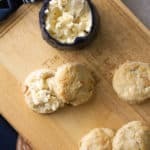 My family loves biscuits and these look scrumptious. As the child of a dairy farmer, I am pretty sure my family owned pretty much every t-shirt made by cows creamery. They had a variety of “punny” shirts featuring dairy cows. True story. But these biscuits look delicious! As a self-professed pepper addict I can’t wait to try! I’ve really been enjoying these dairy features – and this one in particular! I love a good cheddar, and this brings back some wonderful memories of the Maritimes for me too. I was a teenager the last time I was in that part of the country, but I too have some wonderful Cows Creamery memories. The scone itself looks spectacular (I didn’t know you could make them with yogurt – very cool), and the flavours are totally on point. Wonderful stuff! 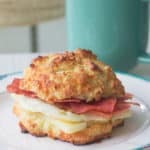 These breakfast biscuits look both delicious and delightful! It always tastes better when we make our own! I will be making these for hubby and I this weekend, for sure!